In full colour and covers the exploration of caves in the Pala Range and Kopili Valley. 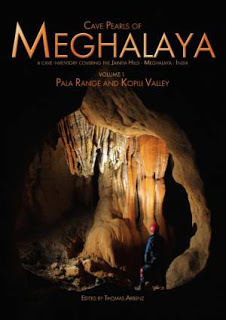 There are chapters on Meghalaya, on the 2010, 2011 and 2012 expeditions in that area, and also on the geology, subterranean ecology, spiders and bats. The second half of the book is devoted to cave descriptions each with survey and photographs plus a list of minor caves and other sites of speleological interest. An unexpected (to me) bonus is hidden inside the back cover - a CD with surveys of the six longest systems, a satellite view of the area with cave surveys superimposed, and an article describing the identification of two new species of bat.